I have a confession, I actually prefer Winter to Summer. I'm not an outdoorsy or particularly active person and I'll always prefer cosy nights in in front of the fire, eating lots of food then being expected to be outside and active all the time. Also, summer clothes don't really suit me and I much prefer what is available in the shops for Autumn/Winter. So today I was delighted that it was so miserable and cold. It was a bit strange suddenly having to think about keeping J warm enough instead of cool enough but I was thrilled to be wearing warm clothes again! I've learned the hard way that you need to buy new coats and boots well before it is cold enough to need them, as by the time you head to the shops all the best stuff is already sold out and more of the spring stuff is coming in. So today, I was all ready to get some new items out of the wardrobe. 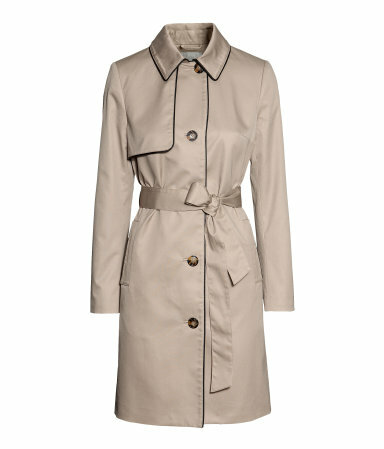 It is also available in beige, black and khaki green and it just fab on, a great fit for the price. 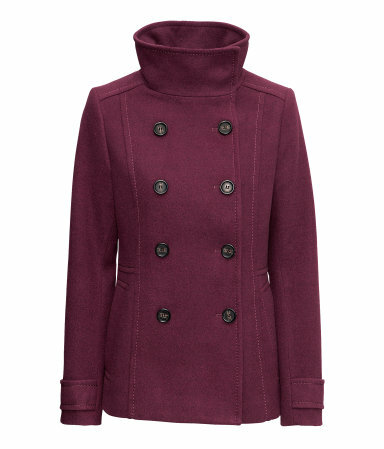 The funnel neck can be done up as in the picture or worn down like a normal collar like the below: For that price it's obviously not made of wool but I reckon I should get a few seasons out of it. This is €50 and to be honest, I haven't ruled out a trip back to Dundrum to get my hands on it. It was heavier than other trench coats I've seen and also fit very well. I ultimately decided it was not a good reason to two reasons, the first being that it is navy. I love navy but I have very strong feelings on wearing navy and black together. I just can't do it, I think it stems from having a navy school uniform. I have two pairs of black winter boots and I knew I just couldn't wear a navy coat and black boots together. Secondly, I think the boyfriend fit would just hang funny on me, I think it's more a look for tall, slim women and would do nothing for a big-boobed shortarse like me. Last winter I bought an expensive pair of black knee high leather boots so I don't need a new pair now and probably couldn't afford it if I did! I did buy a pair of ankle boots. I'm not a big fan of ankle noots normally, I just don't like how they look with dresses or skirts and I've never felt able to pull off ankle boots with jeans. Looking online recently I decided it was time to give it another try, I like how ankle boots look with the currently popular super skinny jeans and jeggings. I figured they were cheap enough that if I didn't wear them much it wouldn't be a huge loss. I wore them today and they are ridiculously comfortable. Mr HNW did say I looked like a pixie but I think I can live with that. but they are in their wide feet range so they would be massive on me. The search continues anyway! Bring on the snow, I am ready! They are having a sale on certain colours in their short boots so these were reduced from £75 to £48 with free delivery to the UK, meaning I only paid €3.50 for delivery using parcel motel. Since I ordered them they have released their new Autumn/Winter 2013 range and there's quite a few pairs that I want. However, I am being sensible. Realistically, how many pairs of wellies can you really wear? 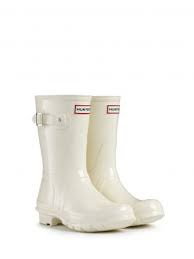 If you are on the hunt for some Hunter wellies I realised recently that in the kids range they do up to an adult size 5. The boots are about 10cm shorter but still, the kids short gloss boots are only £38 so could be a great bargain if you're feet are on the smaller size. So, I'm off to get in to some fleecy pyjamas and get into bed with my electric blanket on - bliss! 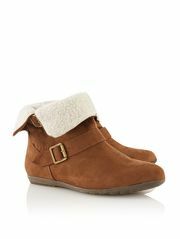 Buying those asda ankle boots! I had a brill similar pair from Tesco but wore them till they actually fell apart and haven't been able to find a comfy pair since. Copying you, boom! They're so comfortable and they come in black too!